Due to its complex past, Wrocław is a palimpsest of overlapping narratives and concealed facts. The title of the exhibition at Wrocław Contemporary Museum makes a perverse reference to a widespread fear that accompanied the inhabitants of Wrocław (even many years after the war) that the Germans would return, which would lead to a loss of property, living space and consequently – another resettlement. 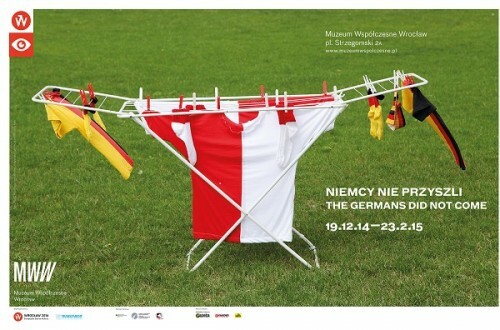 It also draws directly on a work titled The Germans Have Come, from the Disassembly series, created by Jerzy Kosałka, a well-known artist from Wrocław. This ironic work shows tiny German soldiers dismantling the Spire – a gigantic 106-metre-tall propaganda monument that was supposed to illustrate the success of the socialist authorities of the People’s Republic of Poland in re-Polonising the ‘ancient Polish territories’ in western Poland. The exhibition will focus on issues such as emptiness, erasing, memory, presence/absence; it will invite the viewer to look at the city from a different perspective. Apart from suggesting new tropes, it will prompt the visitors to look for and interpret traces of the past, most of which we pass by without noticing them.